How Often Should You Get Carpets Cleaned? Your carpets make up an important part of the cleanliness of your home. We’re not just talking about the appearance of the carpets (though that matters too). What many people don’t realize is that carpets act as a giant dust and dirt filter in your home. They collect not only dust and dirt, but allergens as well. Also, they’re a sizeable investment and can be a pain to have to replace. To keep your carpets clean and fresh while avoiding excessive wear, most groups like the IICRC or the Carpet and Rug institute call for cleaning every 12-18 months. This advice to clean your carpets this often coincides with maintaining the warranty on newly installed carpets, too. Most manufacturers want you to professionally maintain your carpet with a proper carpet cleaning process. What Can You Do To Maintain Carpets Yourself? You should aim to vacuum your carpets at least once a week. High traffic areas will understandably require more frequent vacuuming than, say, under the couch. Vacuuming isn’t just about getting visible dirt or pet hair. it’s also important since it helps to get rid of dry soil particles. Dry soil acts as an abrasive which slowly damages carpet, taking years off of it’s useful life. It can also extend the amount of time between professional carpet cleaning services. When you spill something on your carpet, clean it quickly. While spot cleaning needs vary, in general your first step is to absorb as much of the material as you can. From there, tackle the spot based on the specific item you spilled. For example, to clean up coffee spilled on carpet or cleaning slime from carpet both require different steps. The aforementioned dry soil causes damage to carpets. As does, more obviously, wet muddy shoes. The easiest ways to cut down on dirt in your home or business is to put down door mats. When possible, remove shoes while indoors as well. With proper maintenance, you may be able to reduce how often you need to get your carpets cleaned. However, the best bet is to follow the guideline of 12-18 months for residential carpet cleaning. Commercial carpet cleaning requires a more frequent carpet cleaning service schedule. Scheduled, ongoing professional carpet cleaning is important both to keep your carpets, and your home, looking their best. But, there are also some cases in which is makes sense to get the carpets cleaned off-schedule. Here are some of the common scenarios that may change how often you get your carpets cleaned. Dogs and cats are wonderful companions… unless you happen to be a carpet. Animals track additional dirt and grime into the home (sometimes quite a bit of it). Then there is the inevitable issue of pet odor and pet urine to address. While there are some home remedies that can help with pet odors the only surefire solution is going to be professional carpet cleaning for pet urine and odor. That’s because home remedies and rented equipment just don’t have the power, or appropriate solutions to do the job right. If you are a landlord and you manage your own property, you are responsible for ensuring the house is ready when one renter leaves and a new renter moves into the home. Part of this process includes ensuring the carpets are clean. Although your last renters may have left the carpets stain free, grime and dirt will still build up in the carpet’s fibers. This can cause damage to your carpeting over time. 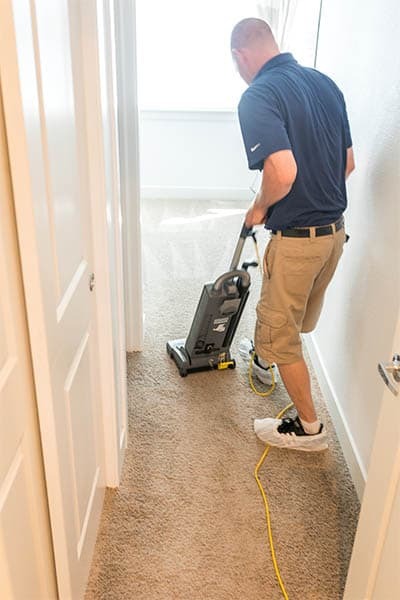 Schedule professional carpet cleaning services before your new renters move into the home. Not only will this provide them with a clean and sanitary place to live, it will also help protect your carpets, which means less money spent on repairs or replacement. Buying a home can be a thrilling time. If you purchase a home with previous residents, then the carpeting should be professionally cleaned before you settle in. Even if the carpeting looks clean, it is a host to a myriad of unsavory substances. Dirt, grime, dander, pet stains and more can be lurking beneath the surface. Professional carpet cleaning will effectively sanitize your carpets and leave them fresh, and almost as good as new. Instead of plopping down on your new home’s carpets with unknown grime, give yourself the peace of mind that your carpeting is clean. Not only is it a great idea to professionally steam clean carpets once you buy a home, it is also a good idea when you are trying to sell a home. Before you show off your property, make sure it is in the best condition possible. Get rid of unsightly stains and a general dingy look through professional steam cleaning. Hopefully this article has helped illustrate the importance of regularly carpet maintenance and professional cleaning. If you are in the Greater Denver Area and you’d like to work with us, please don’t hesitate to reach out with any questions or to schedule an appointment with us.